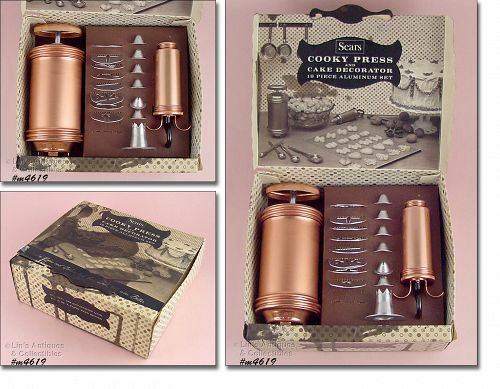 This listing has a vintage cookie press and cake decorator by Sears! The set is in the original box and the cooky (cookie) press and the cake decorator set look new and unused. The box appears to have had black ink spilled on it (see photos). Although the set looks new and unused, there are two discs missing from the cooky press. I would say they just fell out of the box and were lost. Box still has the original price tag “Sears, Roebuck, and Co, $2.99”.